In December 1969, nine African-Americans met in New York City to discuss the unique challenges and limited opportunities they faced in the accounting profession. In that year, there were only 136 African-American Certified Public Accountants (CPA’s) out of a total of 100,000 in the United States. 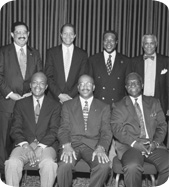 In 1970 NABA chartered its first professional chapter, located in New York City. From these humble beginnings, NABA has become a nationwide membership organization. The national and local programs offered are designed to support the overall goals and objectives of the Association. These programs provide support to, and create opportunities for, professionals and students seeking levels of accomplishment in the fields of accounting and finance. Today, through the efforts of NABA and other interested groups, there are now over 200,000 African-Americans participating in the field of accounting, of which over 5,000 are CPAs. As a leader in the business community, NABA continues to create opportunities for the purpose of enlarging the pipeline of African-Americans into every level of accounting and finance. The mission of NABA, Inc. is to address the professional needs of its members and to build leaders that shape the future of the accounting and finance profession with an unfaltering commitment to inspire the same in their successors. To represent the interests of current and prospective minority accounting professionals To ensure long-term financial stability and provide adequate resources to implement chapter, regional, and national programs. The idea for the NABA logo was conceived by William (“Bill”) Aiken in 1971, when he served as National President. Bill felt that the primary goal of NABA was to lend a helping hand to those African-Americans seeking entry into the accounting profess ion, as well as those already in the profession at that time. He was a member of the audit staff of Arthur Young & Company (now Ernst & Young LLP) at the time. Bill worked with Joan Starwood, the head of Arthur Young ‘s graphics department to create a series of designs which culminated in the adoption of the current logo by NABA’s Board of Directors. Bill ensured that documents were filed to register our logo as a trademark. The symbol is the clasping of left hands in the vertical position inside an unbroken circle. In 1993, NABA’s Board of Directors formally embodied Bill’s ideals regarding the logo in NABA’s motto: “Lifting As We Climb”. The motto is centered directly below the symbol.